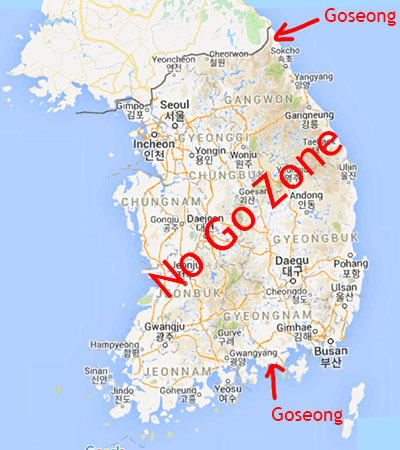 South Korea is made up of Goseongs and No Goseong. 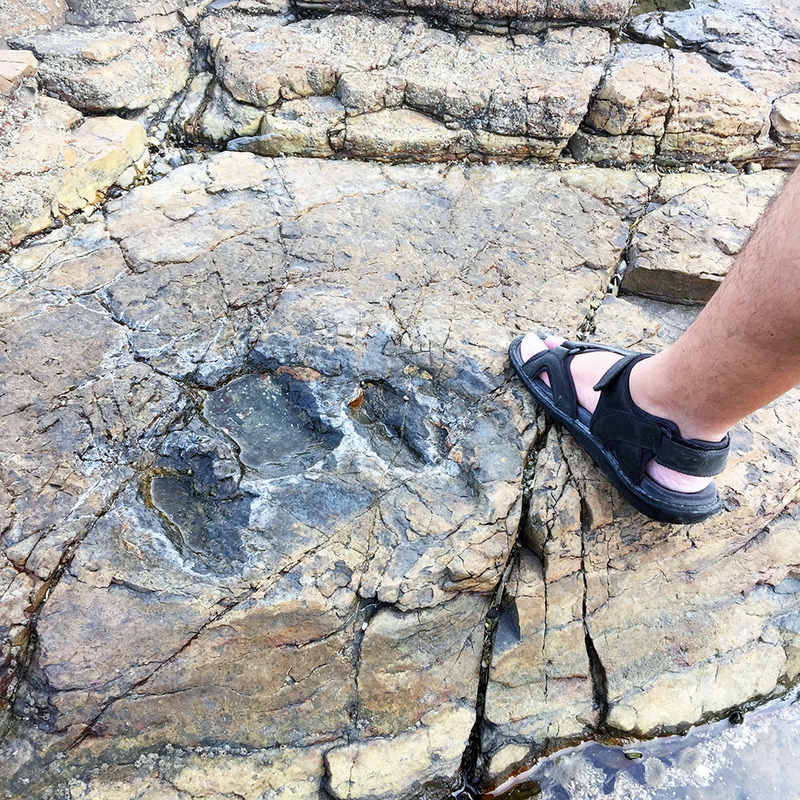 I can’t exactly remember how I chanced upon the knowledge that there was a WHOLE COASTLINE WITH FOSSILIZED DINO FOOTPRINTS in South Korea but no one else was excited and a grand total of me wanted to take the 6h bus ride to trod in the footprints of extinct giant reptiles. The site in Goseong (not that Goseong, the other one!) was fun. There was a (kid-oriented) museum built in front of the coast that had an exit in the form of a really long roller slide that made you feel like bread that goes in one of those quick-toast conveyor belt oven things in the 100-degree-Celsius summer temperatures. Right behind the museum was this free-for-all area that leads to a beach. the beach was well-populated but no one really cared about the rocky slabs connecting the cliffs to the beach. It was, after all only the biggest site for fossilized dinosaur prints in Asia, I guess. Considering how rare such a site is, country is surprisingly laissez-faire about having people stomp all over the prints with their commoner shoes. There was really very little effort to promote the place as a dino tourist attraction and no one really seemed to understand or care about the significance and beauty of that landscape. I missed the last bus that day (which was at 3 or something because no one comes here) and was driven back to town by a friendly local truck driver who spoke zero English but enthused about Guns N’ Roses. Fast forward a lot of years later when there is internetz and 3G and stuff that makes you complacent about remembering where you left your kid, much less where you should take a bus from. I’m headed to South Korea again and wanted to revisit parts of the fossilized coast again. 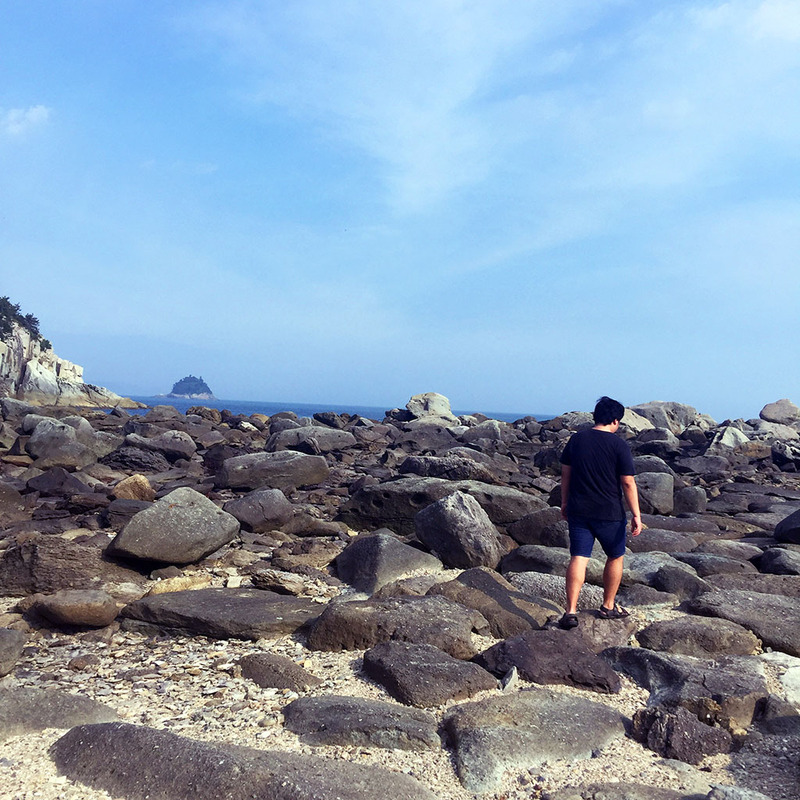 Goseong is still unbelieveably inaccessible but reading through some scientific journals brought me to the island of Sado off the coast of Yeosu in southern South Korea, to the west of Goseong (yes, that Goseong). As it turns out, in a bit of a déjà vu moment, if you search for Sado on Google Maps, you’ll be directed to a Sado in Japan. 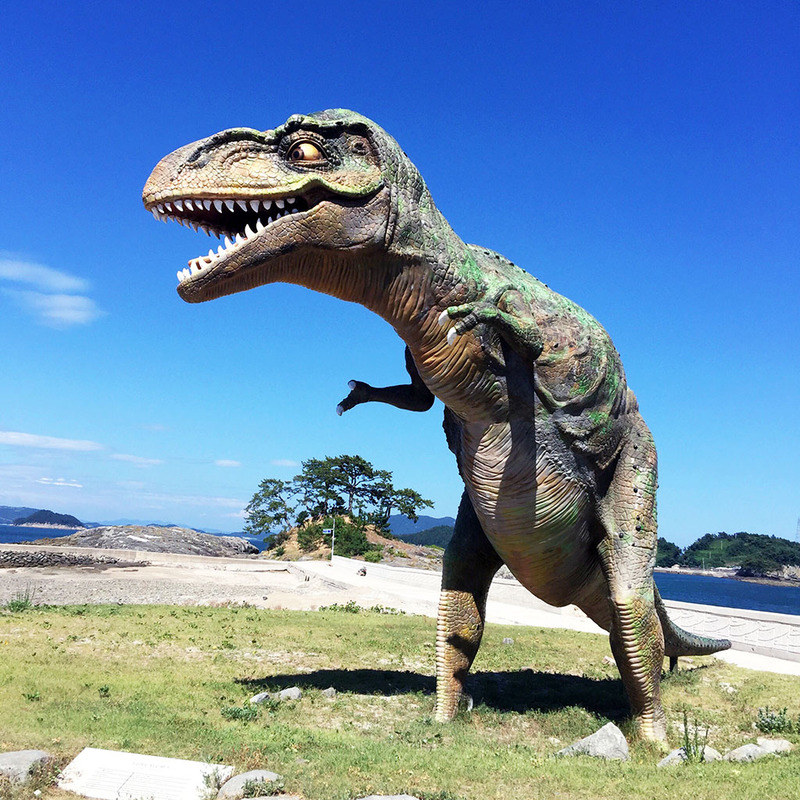 There is very very little information about how to get to Sado, SOUTH KOREA (or more specifically, this island off of Sado which supposedly has the best dino tracks) apart from a general consensus to get myself to Yeosu and then find some means to get into a ferry to Sado. There seems to be some minbak options with regards to accommodation but other than that, very sparse information. In Yeosu, we stayed in a backpacker-ish guest house which I thought had a good chance of guiding us in the right direction (apart from being one of the few real accommodation options we had). The receptionist looked at us like we were crazy before trying to guide us to the more relaxation-friendly, beach destination of I-don’t-even-remember-which-island. He ended up calling the ferry terminal in a failed-but-much-appreciated attempt to get us info on ticketing. I *think* the ferries operated on a first-come-first-serve basis because they weren’t much used, where, upon being filled, they’d leave for wherever. We took one of these ferries the next day in somewhat blind faith. One of the passengers tried to sell us a night in a room in her home towards the end of our trip (in a mix of Korean and sign language) which we rejected because it was a bit weird. We realised pretty quick on landing that we were the only tourists on the island. After wandering around for the best deal in town (ie. for all of 5 minutes before it became a bit stupid because half the homes seemed empty), we tracked down the aforementioned overenthusiastic lady and lived as her and her husband’s pets for the night. Emo walking by the beach because no can walk to bestest island. There were supposed to be some good sets of tracks on another island that was connected to the one we’re on by a thin strip of a few kilometres that’s only above water for a month every year and there’s no passenger ships to get there. The dinosaurs that thrived in this area were some raptor-looking guys with 3 toes. The island we’re on had some good prints and a few abandoned learning centers. There seemed to have been some half-hearted attempt to build the place up as a tourist hub but I can’t imagine how it’d ever be that with the limited accessibility. 3 toes but bigger than you, five-toed freak. We did managed to make it to The Other Island eventually. Our host lady was incredibly helpful and marked the first time I’ve ever seen anyone whistle-hail a cargo ship. The captain disembarked, looked slightly thoughtful and informed us in some English that it wasn’t in their way. She then found another local with a more appropriately-sized speedboat to taxi us across. The Other Island is tiny. It is made tinier because the water levels are higher (hence submerging the bridging strip) and what we realised was that our hosts were probably trying to tell us that there’s nothing to see on that island because the fossilised coast too is underwater at that time of the year. There were a few houses on the whole island but we were the only people around. It is pretty surreal what with the layered rock cliffs and random pools. It’s a little depressing that somewhere, there has to be this group of palaeontologists and geologists that had squealed when they first came across this massive coastal region, imagining the public fanfare when they share their discovery. Asians aren’t really into dinosaurs unless they make good soup bases.